Czechoslovak Legion and the Trans-Siberian Railway. The Cossacks declare their independence and form the Republic of the Don. The Latvians declare their independence from Russia but find it hard to celebrate while occupying Germans are still sitting on their laps. The Bolsheviks demand that authority should be given to the Soviets. The Bolsheviks and the Left Socialist Revolutionaries walk out. The Bolshevik government sends troops to disperse the Constituent Assembly. All non-Bolsheviks get a handbasket each and are told to be gone. The Ukrainians declare their independence from Russia. Civil War breaks out in Finland as a result of the recent Finnish declaration of independence from Russia. A new ruling officially separates the Orthodox church from the state. Religious persecution ensues. Church property will get pillaged and churches destroyed. The Central Powers and the Ukraine sign the Treaty of Brest-Litovsk. 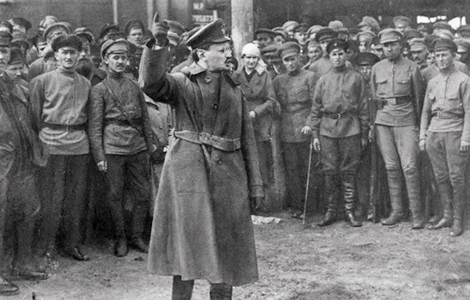 Trotsky declares that Russia is out of WWI. The Bolsheviks gain the upper hand against the Cossacks. Cossack leader Aleksey Maksimovich Kaledin shoots himself. Pyotr Nikolayevich Krasnov will be his successor. Calendar switch - Julian to Gregorian. January 31, 1918 old style was followed by February 14, 1918 new style. Some Russian locations dragged their feet buying new calendars, so we will keep showing old style dates a little while longer. While still under German occupation, the Lithuanians declare their independence from Russia. The Reds capture Kiev. They will stay in town until March 3, 1918, when the Germans will knock on the doors. The Estonians declare their independence from Russia. The Bolsheviks permit the Czechoslovak Legion to leave Russia via Vladivostok. The Red Army has to withdraw from Kiev because of incoming Germans. The Germans let themselves in because the Russians had just signed the Treaty of Brest-Litovsk. The Bolsheviks move their capital from Petrograd to Moscow for safety reasons. Leon Trotsky changes office cubicles. He resigns his post as Foreign Commissar and becomes the new War Commissar. Georgy Vasilyevich Chicherin takes Trotsky's old office chair and becomes Foreign Commissar. Although the Red Army had been already created in January 1918, there is still a lot of work to do. Trotsky whips the bunch into shape and recruits many former Imperial Army officers, some of which joined more voluntarily than others. British and Japanese marines land at Vladivostok. The Germans take Kharkov and Rostov. The Moldavian Republic and Romania declare their union. Russia is against this union and feels Moldavia should belong to Russia. Kornilov gets killed. New commander of the White Army is Anton Ivanovich Denikin. The Transcaucasians declare their independence from Russia and form the Transcaucasian Republic. This Republic will dissolve on May 26, 1918. Aleksandr Fyodorovich Kerensky had remained in hiding until May 1918. Now he emigrates to western Europe, writes books and edits revolutionary papers. The Transcaucasian Republic splits into three separate states. Georgia, Armenia, and Azerbaijan declare their individual independence from Russia. 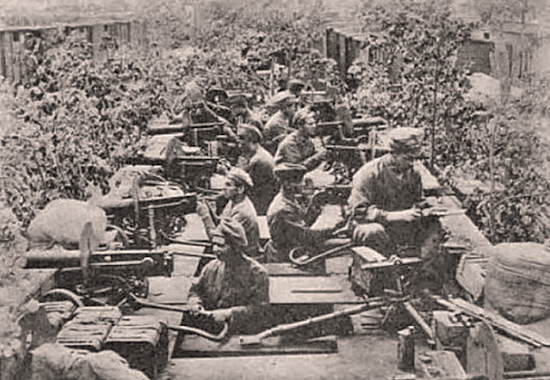 Leon Trotsky, in his capacity of the commissar for war, orders the Czechoslovak Legion to surrender their arms. The Legion refuses and takes control of the Trans-Siberian railroad. The U.S. declares itself sympathetic to the goals of the Czech Legion. Armed collision between the Red Army and the Czech Legion at Chelyabinsk, or Cheliabinsk, which is located in west-central Russia. 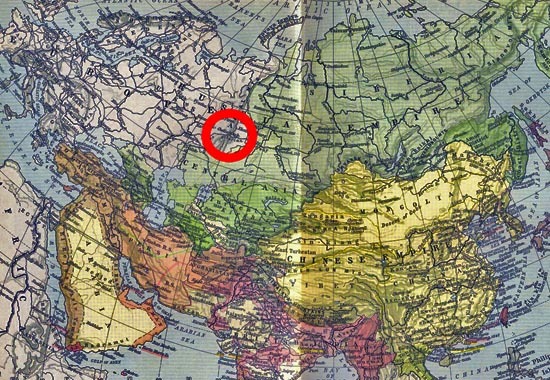 Here is Chelyabinsk on a map. The Czechoslovak Legion and the Socialist Revolutionaries form a government for the Volga, the Volga Republic. British troops land at Murmansk. The Fifth All-Russian Congress of Soviets commences. The left Socialist Revolutionaries who had previously participated in the Bolshevik government, are now expelled. Additional happenings at the congress. The 1918 Constitution of the Russian Soviet Federated Socialist Republic (RSFSR) is adopted on July 10, 1918. Disgruntled Left Socialist Revolutionaries stage a revolt in Moscow. Vatsetis becomes commander of the Eastern Front. White forces and the Czech Legion come dangerously close to Yekaterinburg. Out of fear the former Tsar Nicholas II and his family might be liberated, the Bolsheviks think it too risky to keep the prisoners alive. So they shoot the entire Imperial Family. The Czech Legion captures Yekaterinburg. British and French forces land at Arkhangelsk (Archangel). The Czech Legion together with the People's Army take Kazan from the Reds, who were led by Vatsetis. Kazan opens the door to Moscow. Mamantov moves towards Tsaritsyn. The Siege of Tsaritsyn begins. Battle of Sviiazhsk, also called Sviyazhsk, on the eastern front, which results in a decisive Red Army victory over the People's Army of Komuch. A female assassin, Fanya Kaplan, also spelled Fanny Kaplan, fires three bullets at Lenin as he left a factory in which he had just delivered a speech. Two bullets hit him, one in his jaw, one in his shoulder. Lenin will recover. Leonid Ioakimovich Kannegiser shoots Moses Solomonovich Uritsky, the Chairman of the Petrograd Cheka. The two assassinations are unrelated but the freakish coincidence causes the Bolsheviks to run around paranoid and angry while armed. The Revolutionary Military Council (Revvoensovet) is created. This Council will function as the executive board of the Red Army. In 1934, it will be renamed to Military Council. The Bolshevik government proclaims a campaign of Red Terror. American troops join the British troops at Murmansk. Battle of Kazan in which 11,000 Reds fight 6,000 Whites and Czechs. This battle will end on September 10, 1918 with a victory for the Reds. Colonel Vatsetis becomes Supreme Commander-in-Chief of the Red forces. The Reds re-capture Kazan. The Battle of Kazan had begun on September 5, 1918. Second Battle of Tsaritsyn. This Battle will last until October 15, 1918. A new government is created, the Provisional All-Russian Government, based at Omsk. This Siberian government, sponsored by the Komuch, will last until November 18, 1918, when Admiral Kolchak, currently War Minister in this government, will put an end to it. End of the Second Battle of Tsaritsyn. This Battle had started on September 22, 1918. Poland declares war on the Ukraine. Germany signs the WWI Armistice. The Ukrainians get a new government. Simon Petliura succeeds Pavel Skoropadski. Karlis Ulmanis is the new prime minister of Latvia. The Kolchak Coup - Coup d'état at Omsk. Aleksandr Vasilyevich Kolchak becomes the leader of the White Army, and supposed leader of entire Russia, actually, because he sets up his own government. Kolchak is now a military dictator. Also on November 18, 1918 - Latvia declares independence. Also on November 18, 1918 - Kolchak launches his Eastern Russia Offensive. It will end on December 24, 1918. The Germans withdraw from Estonia and the Bolsheviks pour into the country. 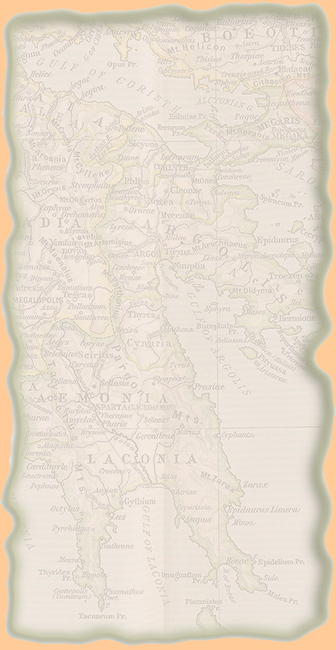 Bessarabia announces its union with Romania. Russia begs to differ. Switzerland cuts diplomatic relations with Soviet Russia. 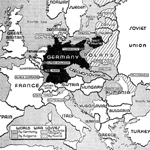 Germany's defeat in WWI exposed the Black Sea to the Allies. French troops occupy Odessa to support the Whites. Kolchak captures Perm and Ufa.